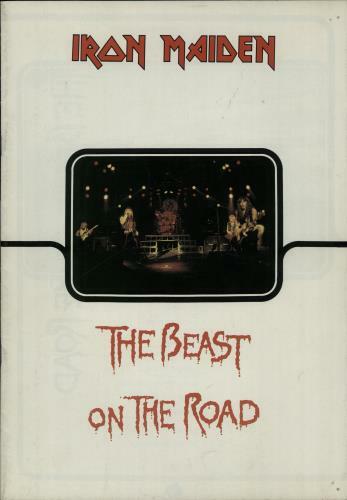 IRON MAIDEN The Beast On The Road (Rare official UK 28-page A4 sized colour tour programme for the UK and European stage [Part 1] of their 1982 world tour to promote 'The Number Of The Beast' album, the first to feature the vocal talents of Bruce Dickinson after replacing Paul Di'Anno at the end of the 'Killer' world tour. This programme features full tour dates for 28 February to 1 May, with lots of photographs of the band in action on stage as well as an introduction from Eddie!, 'live' band picture on the front with 'Maiden Vinyl' advert on the back. The cover shows only light general wear with all pages intact inside with no rips or tears, a fantastic examplei).